Most theaters are dark places – mostly no windows kinds of places. Small theaters of this kind are called “black boxes” because when the lights are turned off the place is black. (This is my own naming theory.) Theatre and performance artists want black places so they can bring in their own flashlights and lamps with colored gels to throw light on the images and actions inside the stories they tell. The theatre is all about focusing and framing. Outside, in the world, its very different. The world is all about open sourcing of air, light, and movement. Once the sun comes up light is everywhere shining on everything. All the cool stuff is out in the open for everybody to share. This makes it very easy to take pretty much everything for granted. This also makes it very difficult to be present to moment – full of overwhelming details. Stop. Did my daughter just say that? I remember believing the same thing for many years. As a boy I felt disheartened when I saw men in hard hats high up on cranes cutting away branches along the country roads of my youth. I thought it was simply a coincidence. 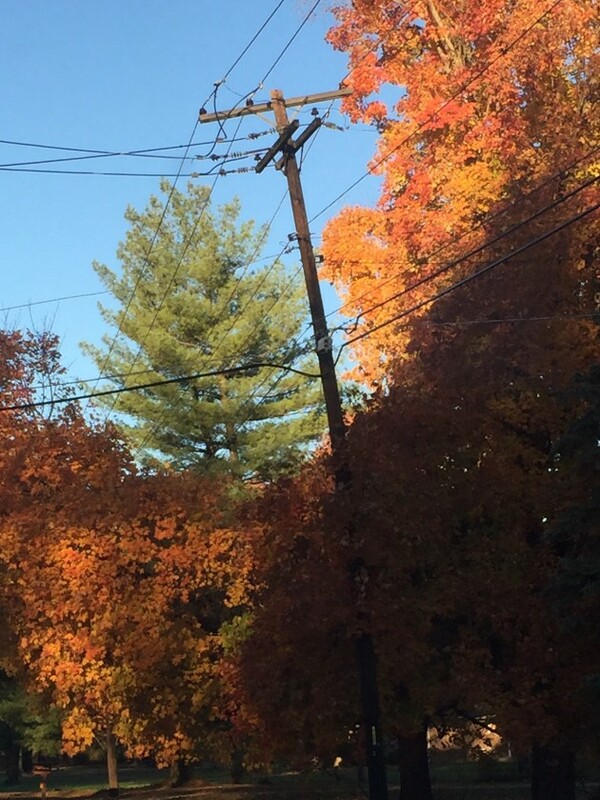 I believed, at that point, that I lived in a world where trees pruned around power lines mimicked trees that “don’t like electric wires” growing around them. I completely forgot this part of my early emergent cosmology of the world. I forgot how tenaciously I clung to my beliefs. I forgot how I used magical thinking to invent transitional theories of how things worked around me. Back then I wanted to be in a world where there was a place for my thoughts, ideas, and beliefs. I suppose this might still be true of any artist who wanders out onto the closest unlit stage with her flashlight in hand? She would be looking for her place among the magic of being alive with others. In the car my daughter is resistant to my version of the trees growing around power lines. I see that I inadvertently opened the lid of a box, the top of an idea, that isn’t ever going to be closed again. She insists that I don’t understand. I shut up hoping that my daughter’s old view of such things might snap back into place and I might get out of the little world-view wreck I just created. I pull up at the entrance to school. The principal is outside greeting the students. My daughter grabs her backpack full of books and tells me that she loves me. There is no point in recording the flood of emotions I feel. I pull out onto the street and in half a mile pass the tree in question. And I thought to myself, “What if my daughter is right and I actually have it all wrong?” For a brief moment I am truly happy being uncertain. Half knowing about things is a lovely way for needing others nearby. I’ll have to do some fact checking but I’m pretty sure the theatre came out of this kind of magic.